Where does the electricity that powers NH's homes and businesses come from? I wrote a brief introductory post for this series earlier. Today I'm plowing ahead with more of the meat. I figured I'd start at the beginning and to me, that means electricity generation. So today's post will focus on the power generation facilities in New Hampshire. I'm skipping over the details about how the electricity industry works in a post deregulation era. The short version is that there are companies that own power plants, companies that provide electricity to end customers, and companies that do both. There's also an organization that maintains the regional power grid. I'll dig into all that in another post. For now, let's take a look at electricity generation in NH. 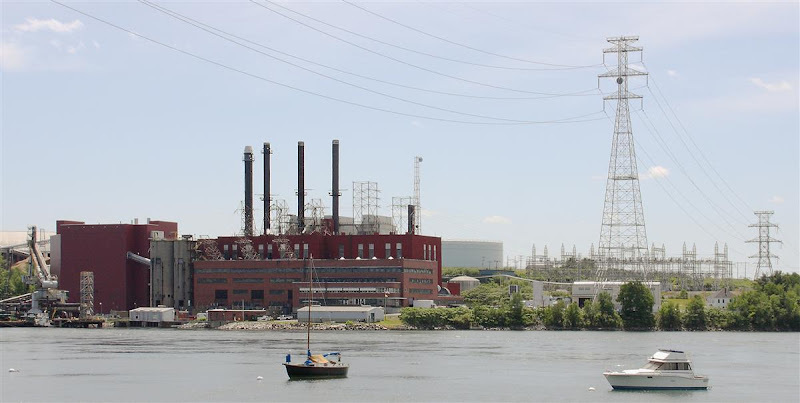 According to the US DOE Energy Information Administration, New Hampshire's power generation portfolio includes over 60 power plants scattered through the state, providing nearly 4500 megawatts of "nameplate" or rated electricity generating capacity. To get some idea of scale, each megawatt of capacity can serve the needs of around 800 homes. 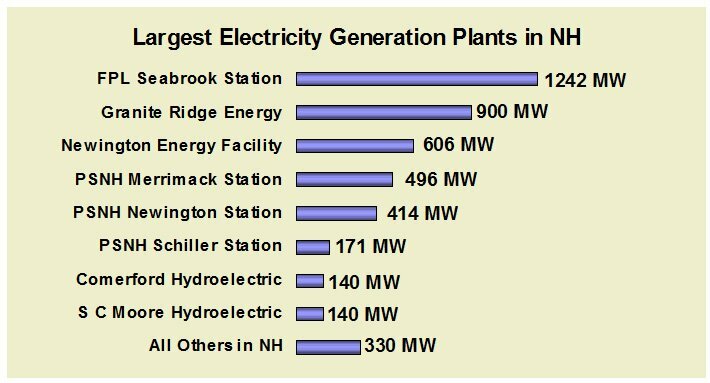 I was surprised to learn that 35 of the 60 plants in NH are small hydropower plants and that over 80% of NH's generation capacity comes from just 5 power plants. Most people in NH have heard about the Seabrook Station nuclear power plant, the state's largest power plant. It's been generating power since 1990 and is currently owned by FPL Energy. The next largest power generator in NH is a natural gas fired plant in Londonderry that's owned by Granite Ridge Energy. The Granite Ridge facility started operation in 2003. The Newington Energy facility is another newcomer, starting operation in 2002. It's a dual fuel plant that can use either natural gas or distillate fuel oil to produce power, depending on market conditions. Next on the list are three PSNH owned legacy plants. Merrimack Station in Bow has been burning coal since 1960, while Newington Station has been making electricity with fuel oil since 1974 (it can now also burn natural gas). PSNH's Schiller Station has been burning coal since 1952, but can now also burn oil. One of the units on Schiller was recently retrofitted to provide 50 megawatts of biomass (wood chips, etc) capability. 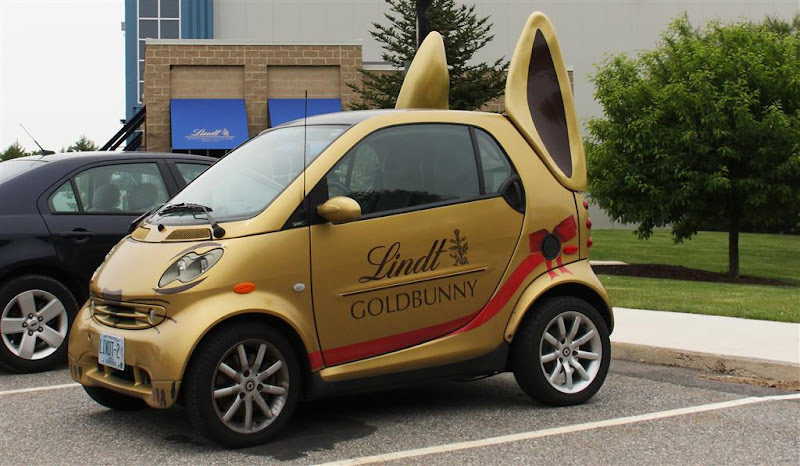 I bet you're wondering why there's a picture of Lindt Chocolate's Gold Bunny car in the middle of a post about electricity. I'd do almost anything to spice up a boring post, but believe it or not, there is a connection. PSNH's Schiller station is working with folks from Lindt & Sprüngli to explore the feasibility of burning raw cocoa beans in Schiller Station's new biomass burner. Rounding out the list of the largest plants in the state are two hydroelectric generation stations in the north country. As I said before, there are many smaller hydroelectric plants in the state, but only two made the list of biggest plants in the state. Comerford Generating Station is in Monroe, NH and has been operational since 1930 and the S C Moore Station is in Littleton and started operation in 1957. These plants are both owned by TransCanada Hydro Northeast. 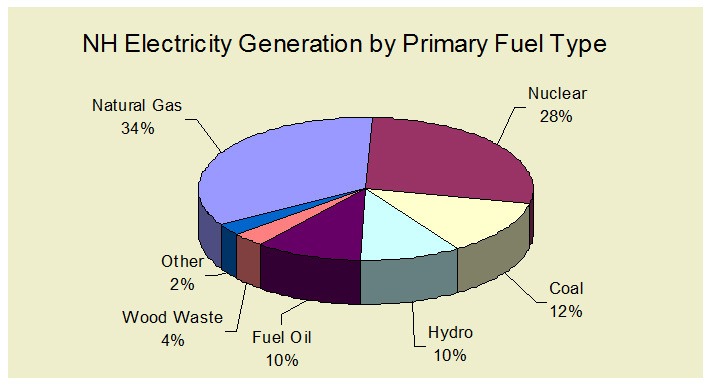 You can see from the chart above that NH's power generation portfolio is well diversified. Renewable energy sources currently make up around 14% of our electricity generating capacity and with several biomass and wind projects in the pipeline, that number is on the rise. Also, although this chart can't show it, many of our power plants are flexible and can burn different fuels depending on which is most economical at any given time. In fact, the chart above has to be interpreted carefully. It shows the percentage of nameplate capacity for each fuel type in our generating capacity, but it doesn't shed much light on how much power actually ends up getting generated by each fuel type in any given year. The nifty Google Map below shows where the power plants are in New Hampshire. It's from David Brooks of GraniteGeek fame, from the Nashua Telegraph. Note that the megawatt numbers I've been quoting are based on "nameplate capacity," which is the rated or maximum power that a given generation plant can output. Most plants don't run at this output for very long, if at all. Power companies vary output depending on demand for power, maintenance schedules, and fuel costs. So as they say, your mileage may vary. 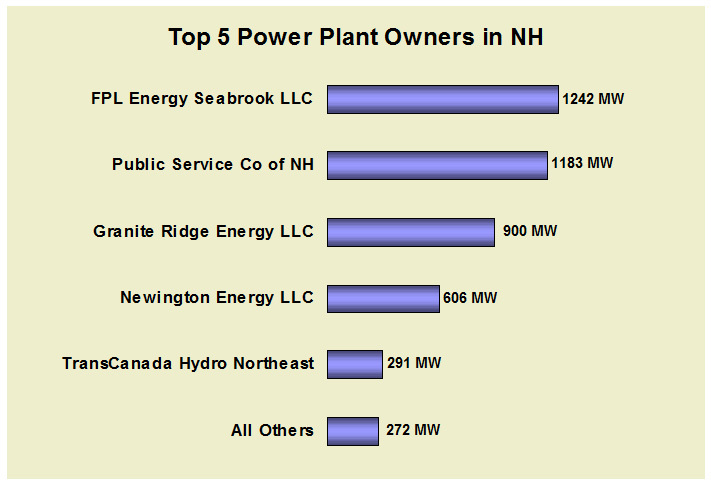 One last chart is a list of the top 5 power plant owners in the state. Probably no big surprises here, since the list closely follows the list of the biggest power plants in the state. One thing that this chart does highlight is that only around 25% of NH's power is generated by utilities (like PSNH), while the other 75% is generated by independent power producers.